Brooklyn's Trouble & Bass crew have safely cemented their brand as the heavy bass champions of the world, bringing heavy, danceable jams with a DIY punk aesthetic that keep it real for even mature audiences (you won't find a pile of 18 year olds who've double/triple/quadruple stacked their pills before hitting up the party, but you will find a healthy dose of fun). Their appropriately-titled Heavy Bass Champions of the World EP series has featured label friends like Samo Sound Boy, AC Slater, B. Rich, Drop The Lime, Star Eyes, Baobinga and more. In the latest installment, due out June 26, duo Zombies for Money provide two big-room bass tracks that blend a Latin, tribal feel with the heavy sound T&B is known for. 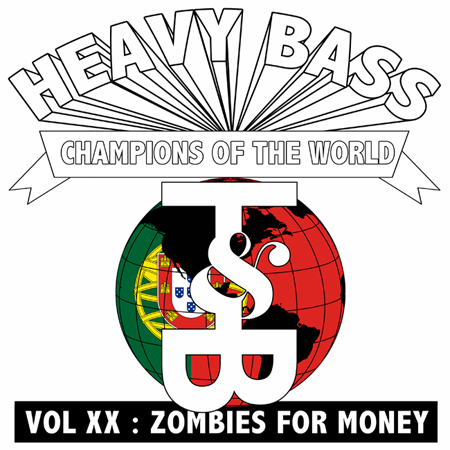 Zombies for Money also provided the soundtrack for Heavy Bass Champions of the World Vol. V, and 15 volumes later, they're at it again. Stream the EP below, premiering exclusively on Earmilk!